(Toronto, Ont.) Team Canada will face Germany for the gold medal at the 2014 Women’s World Wheelchair Basketball Championship after both teams advanced from the semifinals on Friday at the Mattamy Athletic Centre in Toronto, Ont. The gold medal game takes place Saturday, June 28 at 3 p.m. ET, while the Netherlands and the United States will battle for the bronze medal at 1 p.m. ET. The first consolation semifinal of the 2014 Women’s World Wheelchair Basketball Championship saw Great Britain advance with a 58-41 victory over France. The British side will move on to challenge for fifth place in the tournament. Both sides looked tentative to begin the match and a tight opening ten minutes concluded at 9-9. The back-and-forth action continued in the second until Great Britain broke free with eight straight points in the half’s final three minutes to lead 27-19 at the break. The game’s see-saw play returned to open the third with France methodically chipping away at the British lead. A 6-0 streak bridging the two final quarters drew the French side within two at 37-35, but France would get no closer. Great Britain’s offense found its form to outscore the opposition 21-8 to close-out the contest. Watford’s Helen Freeman powered the winning side with a 29-point performance – 17 of which came in the final quarter – to accompany five rebounds and six assists. Fabienne Saint Omer-Delepine of Hazebrouck responded for France with a double-double of 18 points and a game-high 15 rebounds. Great Britain will face Australia in tomorrow morning’s consolation final at 10 a.m. China and France will open the final day at 8 a.m. for seventh place. The match-ups to determine the fifth-to-eighth-place finishers of the 2014 Women’s World Wheelchair Basketball Championship are set. Australia advanced to the consolation final following a close 62-57 victory over China. Even play throughout the first quarter never saw the teams separated by more than three points. After ten minutes, the Australians held a slim one-point lead at 13-12. A close second saw Team Australia stretch its lead to eight, but a pair from the line by China’s Yong Qing Fu brought the half to a close at 32-29. A basket from Fu to open the third cut the deficit to one, but Australia held strong to halt the Chinese advance. Amber Merritt’s field goal with two ticks remaining in the period provided the first double-digit advantage of the game. Australia withstood a 17-12 push from Team China in the fourth to complete the victory. Merritt, a native of Perth, led Australia with 24 points on 75 per cent shooting. Kylie Gauci – the player of the game – added a double-double of 14 points and 10 assists without committing a turnover. China’s Jia Meng Dai answered with 21 points and seven rebounds. The consolation final featuring Great Britain (4-3) and Australia (4-3) will tip-off at 10 a.m. France (2-5) and China (2-5) will meet to settle the seventh-place finisher at 8 a.m. The host nation will play for the gold medal at the 2014 Women’s World Wheelchair Basketball Championship. The Canadians earned their place in the tournament finale with a gutsy come-from-behind 75-74 victory over the Netherlands. The win secures Canada a seventh-straight podium appearance at this event. The game opened with a flurry of activity as both sides looked to gain an early advantage. A close opening period saw Team Netherlands come away sporting a slim 20-16. Team Canada responded in the second to briefly go ahead, but the Dutch answered to take the frame by two and push the gap to 40-34 at halftime. A resilient Canadian side came out in the third with a sturdy defensive effort. The team held the Netherlands to 12 points while tallying 17 to pull within one. Down 52-51 to open the final frame, Team Canada pieced together a quick 8-2 run to build a five-point advantage, but the Dutch answered to keep the game close. The tight contest – which never featured a lead larger than eight – came down to the game’s final moments. A Cher Korver basket with just under ten seconds left put the Netherlands ahead 74-73. After taking the inbounds pass, Katie Harnock sent it across to Janet McLachlan who potted her 12th field goal of the game with 0.9 seconds remaining to complete the comeback. Vancouver, B.C. native McLachlan led the Red and White by notching 25 points, corralling 18 rebounds and collecting seven assists. Harnock added 22 points, six rebounds and five helpers. Cindy Ouellet finished with a double-double of 16 points and 14 assists, marking the third time the Quebec City, Que. product has established a new personal best in assists in this tournament. Inge Huitzing had a game-high 33 points for the Netherlands, while Mariska Beijer contributed 28 points and 10 rebounds. Germany will face Canada for the gold medal in tomorrow’s afternoon affair; tip-off is slated for 3 p.m. The United States will take-on the Netherlands for the bronze medal at 1 p.m. Team Germany capped the seventh day of competition at the 2014 Women’s World Wheelchair Basketball Championship with a 68-58 semifinal victory over Team USA. A fairly even first quarter saw both teams capitalize on their offensive opportunities. Team Germany came out of the period sporting a 21-18 lead, but Team USA responded in the second. A tighter defensive effort limited the number of German chances, allowing the Americans to take the frame 16-11 and go ahead by a pair at halftime. A see-saw third featured several ties and lead changes, but neither team could mount a sustained string of offence to pull away. A German buzzer-beater courtesy of Annika Zeyen tied the match at 46 to conclude the frame. 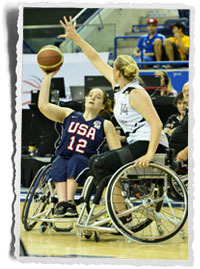 Rose Hollermann opened the scoring in the fourth, but that proved to be the last time Team USA would lead in the match. The Germany side would go on to win the period 22-12. Marina Mohnen once again factored heavily into her side’s triumph. The native of Cologne collected game-highs of 27 points and 10 rebounds. Zeyen and Gesche Schuenemann also reached double figures in scoring for Team Germany. Hollermann finished with a 25-point, eight-rebound effort for the United States. Rebecca Murray added a double-double of 14 points and 10 assists in the loss. The gold medal match will tip-off at 3 p.m. tomorrow. Team Germany emerged with a 64-53 decision when the two countries met in pool play. Team USA will face the Netherlands for the Bronze Medal at 1 p.m. The Americans suffered a 76-64 setback when the teams met in the opening round.